For the holiday season, the folks at Nevermet Press decided they wanted to do something special. 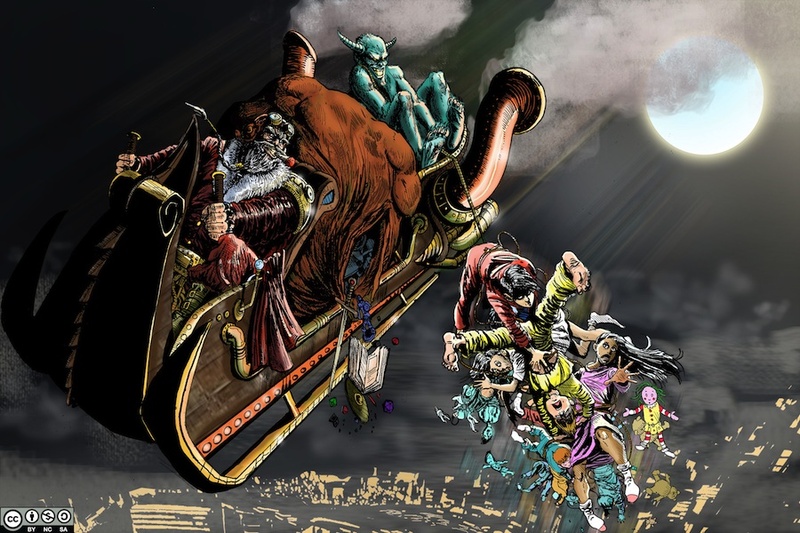 So they contacted artist Steve Austin and had him design a "badass steampunk santa." The result was the Krampus image you see above. In honor of this generosity, numerous blogs across the interwebs are doing their contribution to the giving spirit. This post is my contribution to that. This is intended to be a quick-prep mission for the Warhammer 40k Universe. It will work best with a Dark Heresy game, but could be made to work with Rogue Trader or even Deathwatch if you want to do it that way. Mostly there will be concepts and light fleshing out here, not the full adventure. So feel free to make it your very own. The nobles on the planet of Yulaxia have a problem. Someone, or something, is abducting their children. After the problem is known to be affecting more than just one family or faction, the call goes out to the Inquisition (or to a Rogue Trader friend) and the PCs are enlisted to look into the matter and find out just what is going on. When the PCs arrive on the world they will find it, or at least the upper tiers reserved for the Nobles, decked out in full Holiday regalia to celebrate the "Emperor's Birthday" and the coming of a New Year. Despite this, and the apparent intention of the holiday to be good to each other - if only out of fear of the coming of the Emperor - the nobles are just as snide and snarky to each other as ever. The investigation will likely begin with the PCs looking into which children were abducted from the nobles. There will be no rhyme or reason behind the ordering for the children, and those in their teens are just as likely to be taken as those still in childhood or younger. The order of birth is also not an indication as first borns are as likely to be taken as last borns. The only ones who seem immune to the abduction are those 'children' that would already be called adults, no matter how childish they act. Looking into the abductions themselves, the PCs should come across rumors of a clove hoofed hairy man being seen in the area. Numerous reports to the Adeptus Arbites and the Magistorium to deal with this person will have been reported, but the Arbiters and Magistorum have found no sitings themselves. Members of the victim's families will have heard the rattling of chains and in several cases a thin sliver of a willow branch will have been left behind. Other evidence can come in the form of a clove hoof print by a window, or a sooty hand/finger print on a windowsill (however high up.) Leave more chases of ash and soot and try to lead the PCs to a nearby factory that has smoke stacks...the perfect place for an evening meal. Finally, there should also be an indication that this happens once every 100 years or so. It only happens during the festivities for that holiday, and then goes away. The children taken are never seen again. It should come as no surprise that the villain in this is Krampus. Krampus, in this instance, is a demon of Chaos but not necessarily affiliated with any particular one of the chaos gods. He is going around and taking the worst of the worst from the noble families. Those children and teens who truly abuse their privilege for no good ends. After taking the children, Krampus returns to his factory hide out where he drowns the children in a bathtub and then cooks and eats them in one of the factory's burners. The extra children are kept in cages, and will accompany Krampus back into the warp if he is not stopped before the end of the month. There are enough cages for all the noble children. Krampus is just going in order from worst to "best." If the PCs are having a hard time with finding evidence, or pushing their own agendas, have Krampus up his activity. Most noble children are spoiled and would qualify as being naughty, so have him just start taking more. With a significant portion (say 40-50%) of the nobility's children missing, there should be tons of pressure from above to solve the problem. This gets worse though when you consider that Krampus is eating a lot of the children and thus they can't be saved if they've been gone for more than 10 days or so. In the end, the PCs will have to defeat krampus. As they are adults, Krampus will have no time for them but will try to deal with them if they get in his way. Scale his damage to the system (Dark Heresy should hurt less than Deathwatch, but it should hurt to be hit.) and make the fight quick and brutal if you can. For extra fun, have Krampus make an exception and stuff one of the PCs into his magical sack of kidnapping, then bring them back to be eaten. This can also be a good way to get the players to where the children are being held if they are otherwise unable to find the trail. In the end, the PCs should save the day, but many of the children will have been lost. This should cause for an interesting end result with some nobles feeling truly indebted to the PCs, while others may see the PCs as having let their children die. I'm sure you can have fun with it, and that is the main point, no?